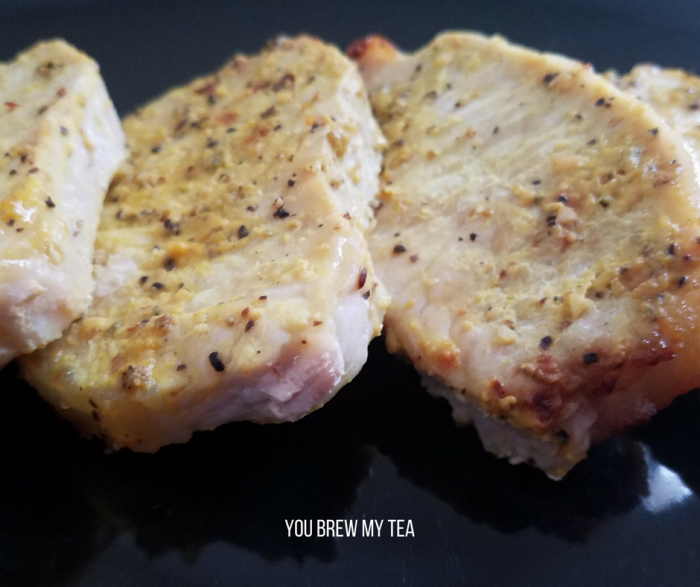 An air fryer is a new appliance in our kitchen, so testing it out with some fun recipes like these Honey Mustard Pork Chops for the guys has been a must. 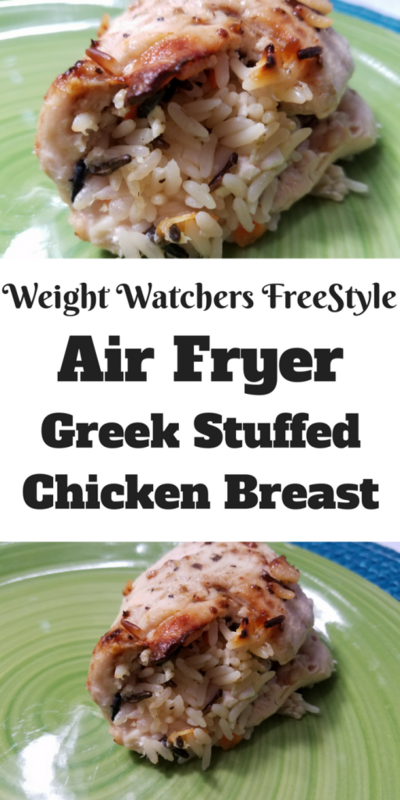 I love easy recipes, and the air fryer makes things fast and delicious. Center cut pork chops are on sale a lot these days, so this is also an affordable option. 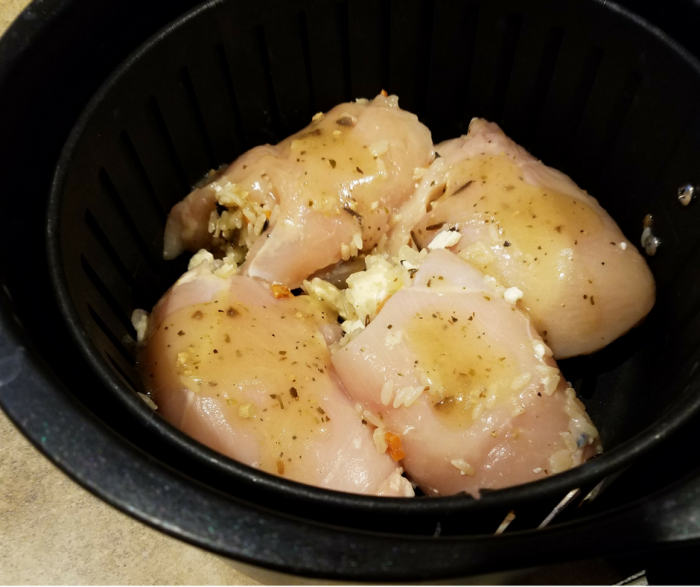 We’ve been using an air fryer a lot and learning how to make it work well for our family. It’s excellent for making crispy items without all of the added oil, so that is always going to be a hit for this Southern gal transplanted to Michigan. The GoWise Air Fryer is popular because it is affordable and works well. I have a smaller VonChef Air Fryer since I don’t make large portions, but definitely, recommend a larger option if you can afford it for use on a regular basis. In a small bowl, mix together mustard, honey, and steak seasoning. Brush mustard mixture over both sides of pork chops. 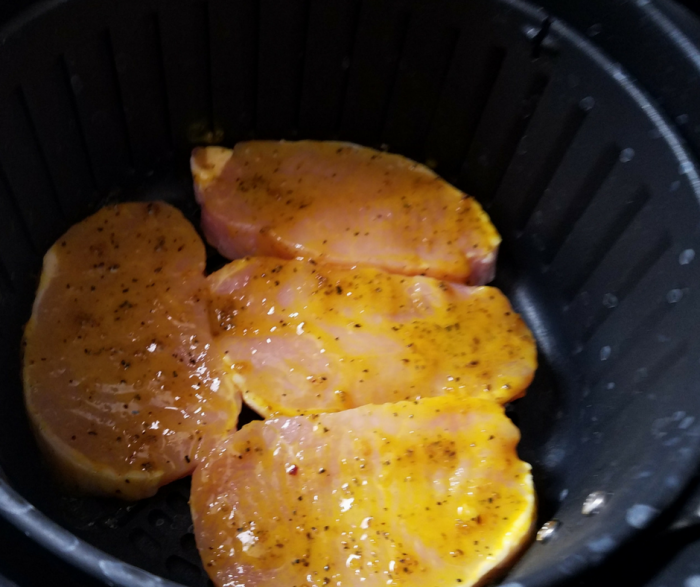 Place pork chops in even layer on the bottom of air fryer basket. Set to 350 degrees and cook for 12 minutes, flipping halfway through cook time if desired. 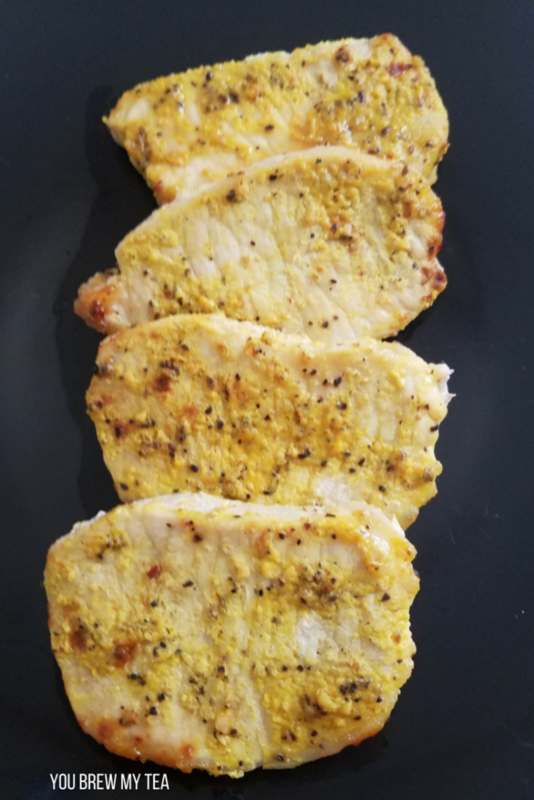 Make these honey mustard pork chops and serve alongside your favorite vegetables, rice, potatoes, or even riced vegetables for a great low point meal on Weight Watchers. It’s kid-friendly, easy, and affordable. That makes it a big hit for busy moms. Using the air fryer cuts out the oils and fats, and the homemade honey mustard makes sure you have the flavor you want without tons of extra calories! 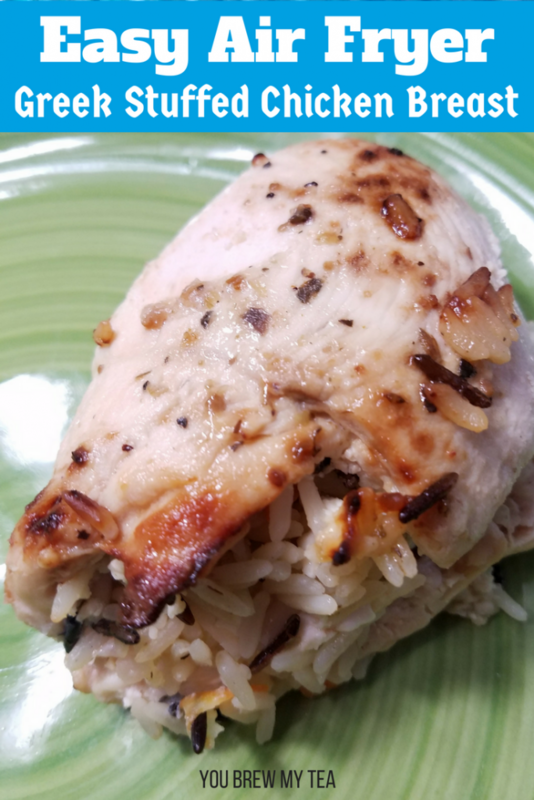 This Air Fryer Greek Stuffed Chicken Breast was a huge hit with my guys. It was so simple to make, ready in under half an hour, and healthy! I love serving with a big salad, but you could also add in some of your favorite steamed or roasted vegetables on the side. This is a great way to create a meal plan that everyone loves! For this air fryer recipe, we use our own homemade Greek Salad Dressing linked below in the ingredients. 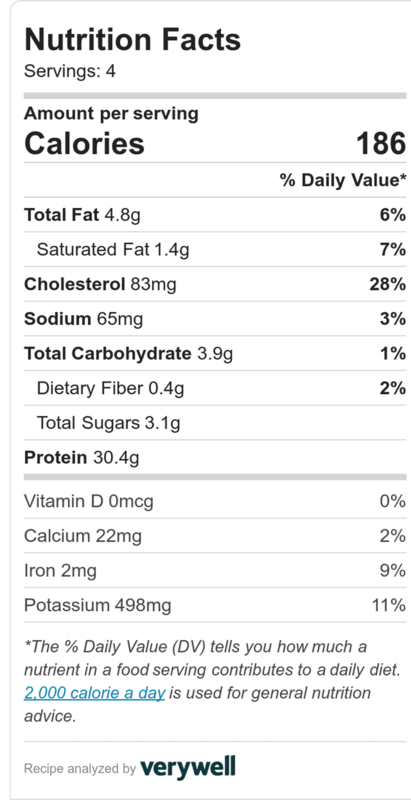 You can use any low-fat Greek Salad dressing, but you may want to recalculate your points just in case it changes things a bit. 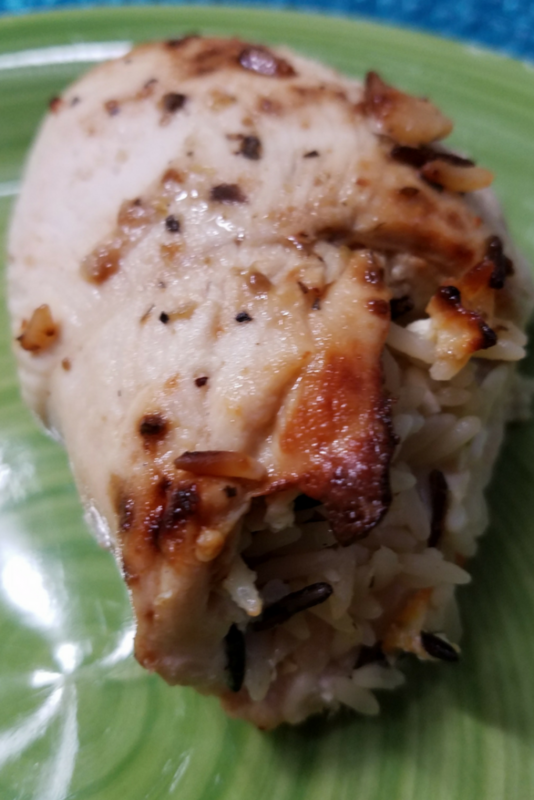 Making Greek Stuffed Chicken breast was an easy option when I had just a little time and wanted something different than just a plain piece of chicken for dinner. I have a Von Chef Air Fryer, however, a larger air fryer would be recommended. As you will see in pictures below, 4 chicken breasts is a tight squeeze in mine. The GoWise is very popular, and the Simple Living brand are both great options that have good reviews. Slice chicken breasts in half, making a total of 4 pieces of chicken. Between two pieces of plastic wrap or parchment paper, pound the chicken breasts until thin. In a small bowl, mix together prepared wild rice, 1 tablespoon Greek dressing, and fat-free Feta cheese. Place 1/4 rice mixture onto center of each chicken breast and roll covering mixture. 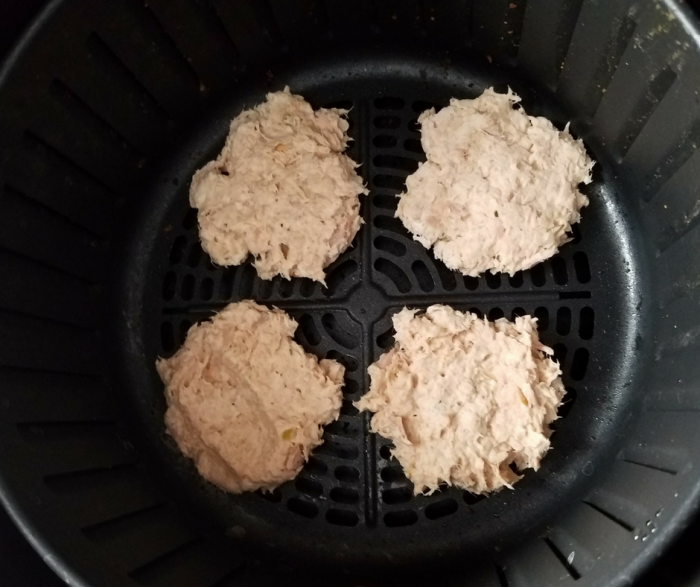 Place each chicken breasts rolled side down into air fryer pan. Cook at 382 degrees for 15 minutes, or until internal temperature reaches 165 degrees. Place ¼ rice mixture onto center of each chicken breast and roll covering mixture. 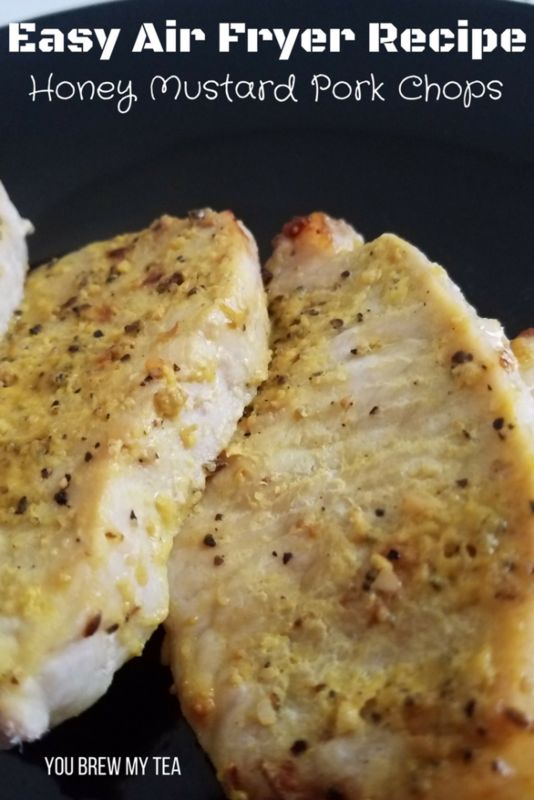 I am still new to using an air fryer, so this was definitely a great recipe to start with. It makes cooking easier, faster and gives that texture I am looking for without heating up the kitchen. 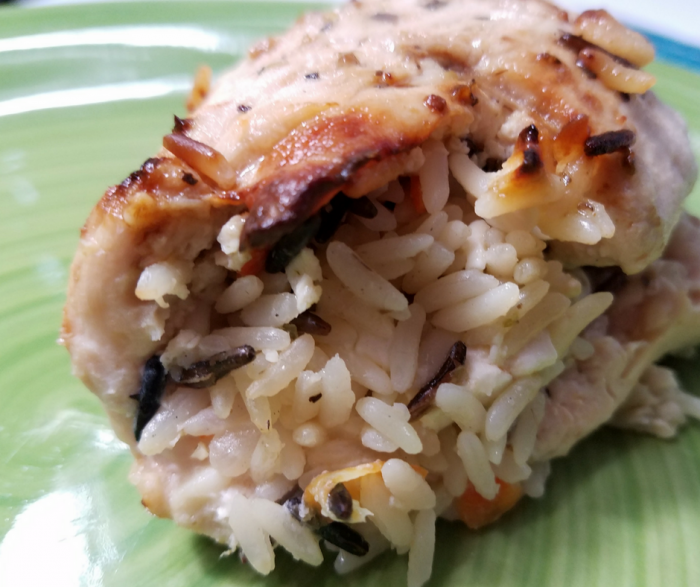 This Greek Stuffed Chicken Breast recipe is a perfect option to fit into your weekly meal plan! It is savory, easy, and kid-friendly! 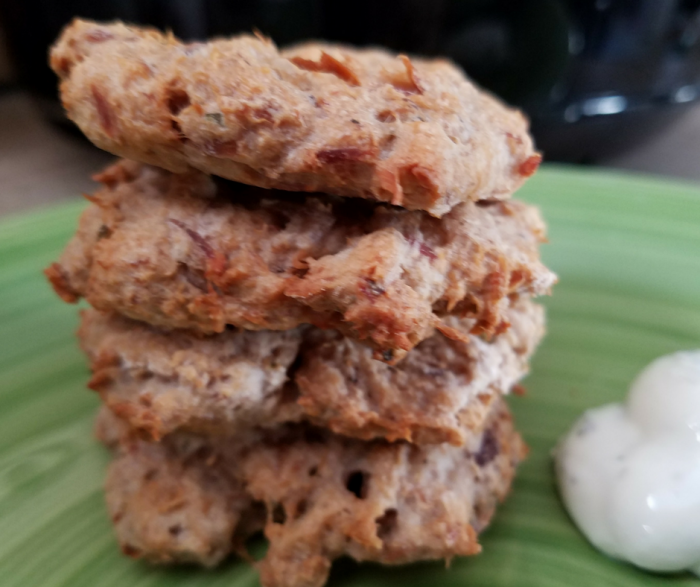 Growing up, my mom and grandma would often make tuna patties or tuna cakes. 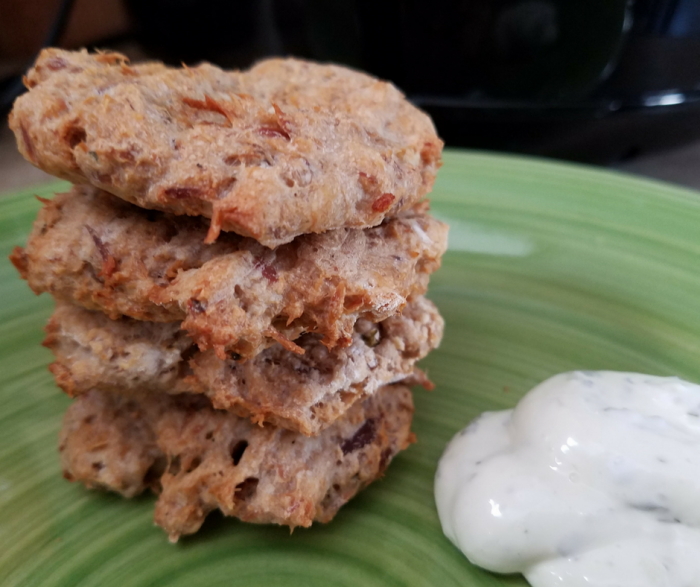 This Air Fryer Tuna Cakes Recipe is one of those remakes that takes tons of oil out of their classic pan-fried recipe. I remember many times seeing my mom turn a small can of tuna into a meal for 4 people with a few simple additions. While this recipe is much simpler than hers was, it still has the same flavor and affordability I remember as a child. A few months ago, I invested in an Air Fryer. The VonShef 3qt Air Fryer is the one that I picked up. It is on the smaller side, so works great for our family of 3. If you have a larger family or need larger portions, definitely invest in a larger air fryer like the Homia 5.5qt Air Fryer. The price is nearly double, but well worth it when you are making larger portions. I wasn’t sure what all I would use it for, or if it would really work for me. While I am still following a plant-based diet almost exclusively, my Beau and son aren’t, so these are a great option for them to eat. I have fallen in love with using it for things like veggie egg rolls, tater tots, roasted potatoes, and potstickers. It can also be used for meats and tofu. In a small bowl, mix all ingredients together until well blended. Will be slightly moist, but should be able to form patties. Divide into 4 equal portions, and create small circular patties. Lay in the basket of air fryer in a single layer. Following your air fryer directions, close and set to 380 degrees for 10 minutes. You may flip each patty halfway through if preferred, but it will cook well either way. 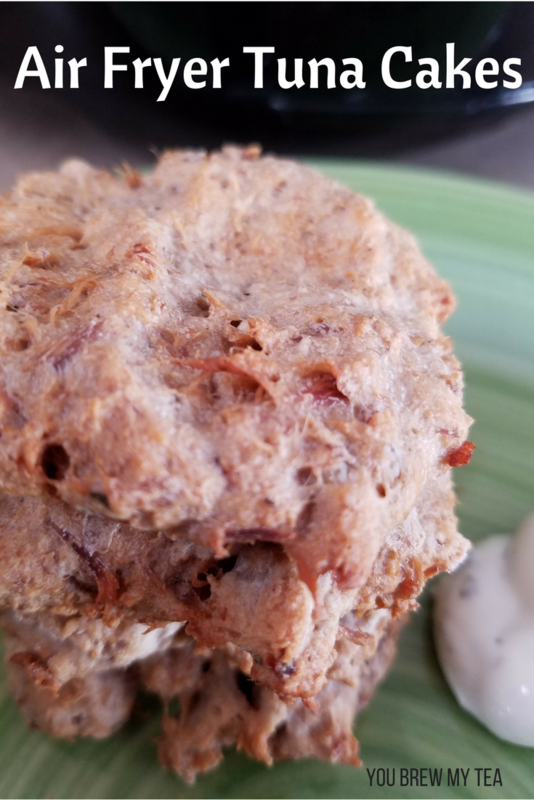 No matter what Weight Watchers plan you are on, this air fryer tuna cake recipe is a great point friendly option. 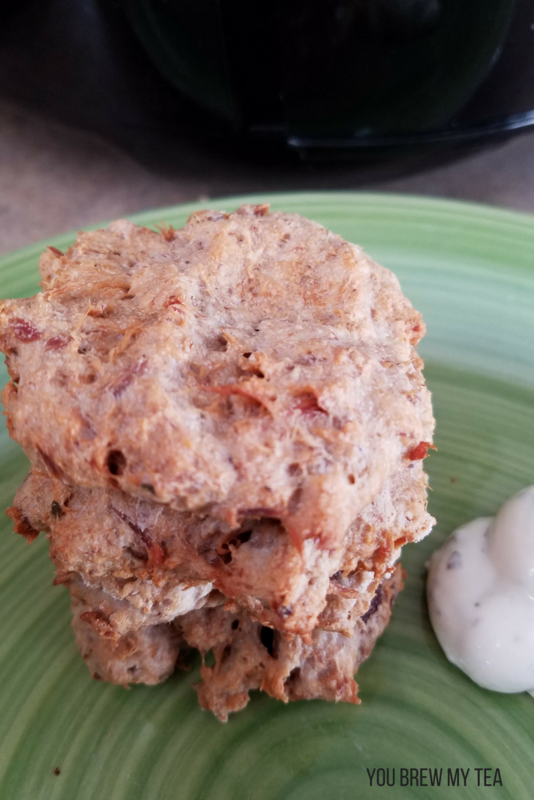 You can easily double or triple this recipe to fit your family needs, but just 4 patties is a great lunch or dinner option. Serve with your favorite low-fat or homemade tartar sauce. With such low points, you can easily fit in your other comfort food favorites like macaroni and cheese or even mashed potatoes and a side of steamed vegetables. If you are looking for more great recipes, don’t forget to join our Weight Watchers Support Group on Facebook!